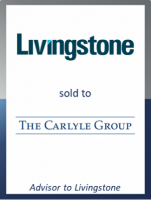 GCA Altium acted as exclusive financial advisor to Livingstone Holdings Limited, the leading independent provider of software asset management services, on its sale to The Carlyle Group. Founded in 2010, Livingstone offers a full range of services covering all major enterprise software vendors. The company works with clients to collect and analyse information in order to establish their effective licence positions, determine if software usage is higher or lower than legally contracted, address any related issues, and create a framework to optimise their software deployment over time. Livingstone has delivered strong revenue and EBITDA growth over the past few years and now provides software asset management services to a blue-chip, global enterprise customer base spanning multiple sectors and countries. Livingstone is a prime example of a company using proprietary technology to deliver a managed services offering in a highly efficient and profitable business model. The transaction represents GCA's 12th tech-enabled services transaction in 2018 to date, reinforcing our reputation as one of the leading M&A advisors in this sector.